Have you ever wondered why your friend can devour a slice of chocolate mocha cake covered in whip cream without missing a beat, while even the smell of chocolate goes straight to your hips? Or have you noticed how some people thrive in their jobs, while others languish in despair? Or why some people stay fit without lifting a finger, while others toil at the gym form hours on end, seeming to get nowhere? And why do you love a good party while someone else just can’t stand to be in a crowd for even a few minutes? Well, Ayurveda has the answers. As one of the most comprehensive systems of health and medicine, the ancient science of Ayurveda tackles the questions of our human health and wellbeing in a profoundly deep, yet easy-to-understand way. You see, Ayurveda doesn’t just view all people as the same, like our modern Western scientific model does. Ayurveda understands that, although we all have things in common, at the deepest levels we are all truly unique. In order to be healthy and to live a fulfilling life, we must gain insight into our own “uniqueness” and, in turn, what we as individuals need to do to reach our full potential in this life. 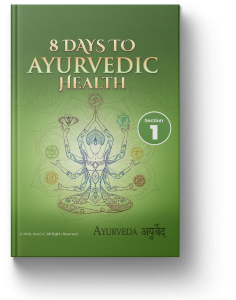 8 Days to Ayurvedic Health is a step by step exploration of the principles and practices that underlie this amazing science – presented in easy-to-understand terms, along with simple tips to help you instantly improve your life and your health. Your Ayurvedic Constitution – what makes YOU so special? How to improve your sleep, your digestion, your energy levels… and much MUCH more. So what are you waiting for? Start your journey today and type your email below and hit SUBSCRIBE.